Transmission Films is delighted to announce that Jane Fonda will attend the Australian premiere of her new comedy Book Club on Sunday 26 August at Event Bondi Junction, Sydney. Jane Fonda is one of the world’s most iconic actors. A winner of two Academy Awards, three Golden Globes and a Tony Award, her credits include Barbarella, On Golden Pond, The China Syndrome, Klute and Coming Home and the current Netflix hit Grace and Frankie. Jane Fonda will be in Australia for An Evening with Jane Fonda on Monday 27 August at the Sydney Opera House and on Tuesday 28 August at Hamer Hall, Arts Centre Melbourne. 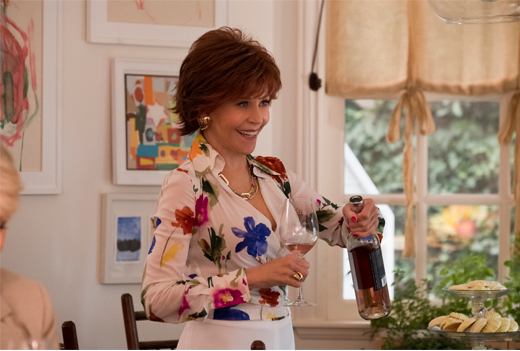 Jane Fonda stars in Book Club alongside Diane Keaton, Mary Steenburgen and Candice Bergen. Diane (Diane Keaton) is recently widowed after 40 years of marriage. Vivian (Jane Fonda) enjoys her men with no strings attached. Sharon (Candice Bergen) is still working through a decades-old divorce. Carol’s (Mary Steenburgen) marriage is in a slump after 35 years. The four lifelong friends’ lives are turned upside down to hilarious ends when their book club tackles the infamous Fifty Shades of Grey. From discovering new romance to rekindling old flames, they inspire each other to make their next chapter the best chapter. Book Club opens in cinemas across Australia on 23 August 2018.